Being an actor/author isn’t always the easiest path. There is so much rejection and self-doubt there are times when it just doesn’t feel like it’s worth trying to tell your story. And then you upload your rerelease of a book onto Amazon and reach number three in your category without even promoting the book. I was walking into my (current) home the other day, and there were two boys playing outside. By playing I mean they had a nerf gun and were trying to shoot each other, but that’s their parents’ problem. How I became so old and bitter that their pretending to be a character without knowing the character’s name really bothered me. But then I realized I’m not crazy. They should know Neo’s name if they’re going to be looking to him for guidance on how to dodge nerf suction darts. What would the world of geekdom be if we didn’t protect the names and honor of our heroes? If you had to leave the world, what would you miss the most? Not your friends and family (they can come with you); you have to leave the world itself. Fields and streams, mountains and oceans, even blizzards and thunderstorms must be left behind. Would you miss the scent of salt coming off the ocean? Maybe the victorious feeling of summiting a mountain? Maybe it’s busy streets and rock concerts that you would pine for. My new YA mid-apocalyptic sci-fi Girl of Glass is now available in eBook and paperback! If you’re a person who reads, you’ve probably read a dystopian novel. From Hunger Games to Divergent, Lord of the Flies to Maze Runner we’ve seen plagues, corrupt governments, and all sorts of suffering as the world crumbles. But we always seem to look up from the bottom. The stories of the end of our world are told from the point of view of the bottom. Those who suffer, starve, and bleed. Who fight for every scrap of food and wonder each night if they’ll live to see morning. The ones who the tumbling governments have chosen to abuse or experiment on. But what would the end of order look like from the top? If you were one of the chosen one percent who were meant to survive, how would you view the decaying world? Would you be like the rich in the Capital of Panem, seeing the poor as little more than animals that can be killed for entertainment? Would you be a doctor and create a terrible maze to study the ill? Magnolia Kent can’t stand to see either of those terrible things happen. 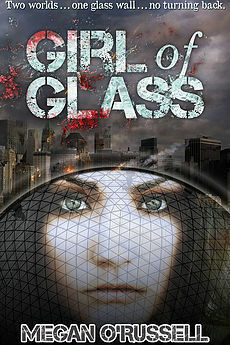 Looking at a dystopian world from the point of view of privileged compassion is what began the story of Girl of Glass. What are the moral implications of the survivors? How much pain can you ignore and still call yourself human? But compassion is costly, and when the world is being driven into darkness, touching the shadows comes at a terrible price. Those are the choices Nola Kent has to make. What would you choose? How much suffering would you be able to watch if you knew you could stay safely away from it? Could you lose the compassion that defines us as humans in order to preserve the human race? Giveaway ends December 16, 2016. I’ve been AWOL cause it’s been a week. I am very sorry, guys. There was tech, and not just any tech but tech for a massive holiday review. Then we helped my mom find a house, which is amazing and has countertops to die for. I’ve crawled back into the editing cave with The Tale of Bryant Adams: How I Magically Messed Up My Life in Four Freakin’ Days. And blogging fell to the wayside with doing my laundry and going grocery shopping. Oops.